Organizers of "Bus number 7"
After spending his time with in various, less interesting jobs he realized it was time for a change. For about a year he only organizes adventure tours, after he spent a month as the co-organizer of the Caucasian Challenge, his new task is to lead the team of Bus number 7 in 2009. Apart from this he's responsible for the mechanical/technical preparations of the bus. He traveled extensively in the past as a crew member or captain of sail boats from the Mediterranean to the Caribbean. 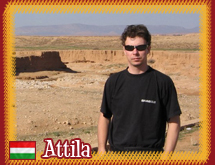 He fell in love with Africa on the 2007 Budapest-Bamako rally. 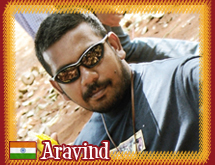 Aravind is a real cosmopolitan. He was born in South India, the state of Tamil Nadu as son of an influential industrial family. He graduated in Chennai (Madras), arrived to Budapest in 2000 for a study tour and the magic of the city made him stay there. He runs an internet marketing/e-commerce company in Budapest, meanwhile he started the first "boutique" hostel in India. Nowadays he spends a lot of his time on organizing adventure tours. He is the brain behind and lead organizer of the popular Autorickshaw Challenges. He participated the 2006, 2007 and 2008 Budapest-Bamako rallies and the 2008 Caucasian Challenge. He loves traveling, partying and everything that involves a sense of fun and adventure. His task in the "Bus number 7" project is international communication and relations. Graduated in marketing in 1996, then worked for ten years for various multinational advertising agencies. Meanwhile he realized that life can offer more excitement than convincing clients not to enlarge their logo by 10% on the layouts. He lives in Budapest but spends months in other parts of the World from South India to the Balkans or the Caucasus as the lead organizer of the Caucasian Challenge. He was part of the organizing team of the 2007 Mumbai Xpress autorickshaw challenge. Traveling is essential for him irrespectively of the destination, either a small village in Hungary or the deserts of South Iran. He teamed up with Szabolcs for the 2007 Budapest-Bamako rally in a 23 year-old soviet Lada. His sympathy for the poor in Africa made him stuff their car full of gifts. Coordination of sponsorship, marketing and charity work are his tasks in the "Bus number 7" project.